Editor's note: This story was updated on April 7 after the Texas House passed its budget. Included in the fray were Gov. Greg Abbott, who saw one of his prized economic development programs defunded; Patrick, who heard a resounding "no" when his favored proposal to subsidize private school tuition with public funds was put to a vote; and Attorney General Ken Paxton, who lost more than $20 million from his agency’s budget for lawsuits. On the winning side of the House budget debate were child welfare advocates, who saw funding for foster care and Child Protective Services tentatively boosted; social conservatives, who scored $20 million for the Alternatives to Abortion program; and the lieutenants of House Speaker Joe Straus' leadership team who, in a display of unity, easily brushed aside most challenges from far-right Republicans. Statewide GOP leaders took some of the heftiest blows in the House chamber. Lawmakers there voted to strip $43 million from the governor’s Texas Enterprise Fund, the "deal-closing" fund the state uses to lure businesses from elsewhere, and divide it into two equal pots: one for Child Protective Services and foster care funding, the other for a program that pays for disabled children’s physical, occupational and speech therapy services. Both are hot-button issues that have dominated the House’s budget negotiations during this legislative session. State Reps. Mike Schofield, R-Katy, and Matt Krause, R-Fort Worth, spearheaded the effort, saying the environmental agency had been allotted funding in excess of what leaders there had actually requested. Anti-abortion groups such as Texas Right to Life took to Twitter to rejoice the amendment's passage, which received 92 to votes in favor to 50 against. Another proposal that died without a vote would have regulated bathroom use in government buildings, mirroring the spirit of the Senate's controversial “bathroom bill.” The proposal, by state Rep. Valoree Swanson, R-Spring, appeared to be withdrawn as part of a compromise to bypass floor debates on dozens of amendments and instead insert all of them into a non-binding portion of the budget widely referred to as "the wish list." 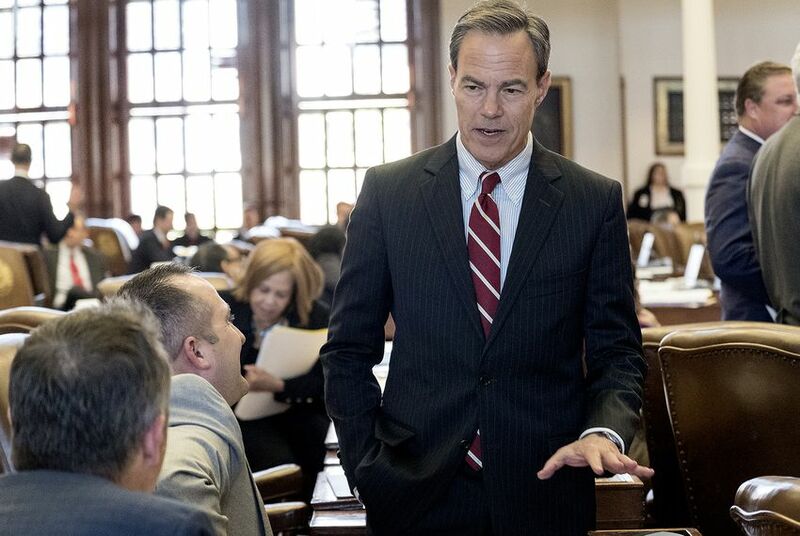 The House agreed to the compromise just before 2 a.m., shortly after the passage of an amendment by Tea Party-aligned state Rep. Matt Rinaldi, R-Irving, that is meant to bar state government funds from Planned Parenthood. It passed 101 to 43. Then, just a few minutes later, the chamber approved its overall budget. That apparently offended rural lawmakers, notably state Rep. Drew Springer, R-Muenster. In response, Springer attached an amendment to Stickland's proposal that would cut the same amount of funding for the Texas Department of Transportation, but only for roads and highways in Stickland’s hometown of Bedford. The Texas House on Thursday voted unanimously to cut the Texas Alcoholic Beverage Commission's travel budget and restrict its use of money from outside groups following Texas Tribune reporting on the agency's travel habits.